Melissa Blakesley is popular as the girlfriend of American football wide receiver Larry Fitzgerald. Melissa is the mother of Larry's child Apollo. Her boyfriend Fitzgerald plays for the Arizona Cardinals of the National Football League. Melissa and boyfriend Larry Fitzgerald is yet to get married. However, they together share a child, Apollo. On the basis of research, we came to the conclusion that Melissa Blakesley has no source or earnings and salary. Her net worth in 2019 is not yet disclosed. Whereas her boyfriend Fitzgerald earns $11 million in 2019 and has a huge net worth of $97 million. The couple used to live in an expensive house in Paradise Vally, Arizona which Fitzgerald listed for sale for $5 million in 2019. Neither married nor single, Mellissa Blakesley is currently involved in a romantic relationship with Larry Fitzgerald. Blakesley and her boyfriend started dating each other in the early 2010s. The couple welcomed their first child, son Apollo on April 23, 2013, which is the second child of Melissa. She has another son named Darion Dylan Blakesley from her previous relationship but the details about the child's father is not disclosed. 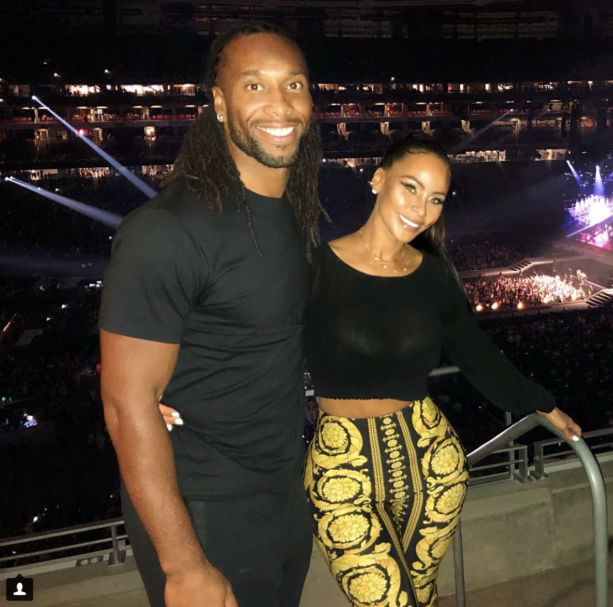 Melissa and Larry Fitzgerald came publicly in around 2014 and started posting photos together on their social media. The couple is living happily together till date and has a mutual understanding. Melissa Blakesley was born to her parents Jean and James Blakesley on May 20, 1979, in Illinois. She has three siblings; a brother named James and two sisters Anna and Cherin. Her star sign is Gemini. Melissa holds an American nationality and is white by ethnicity. No any professional record of NFL WAG is available till date. So, it seems like she is not involved in any works besides being a proud supporter of her boyfriend in the stands during his game. Her boyfriend Fitzgerald is a popular figure in NFL as he was the 3rd overall pick in the 2004 Draft. He was recently featured in the NFL 100 Super Bowl commercial despite any Super Bowl appearance for a decade. Fitzgerald was also on the tabloids most recently for his admiring comments on New England Patriots quarterback Tom Brady. "He's the G.O.A.T. There's no question about that."